View More In Jewelry Towers. 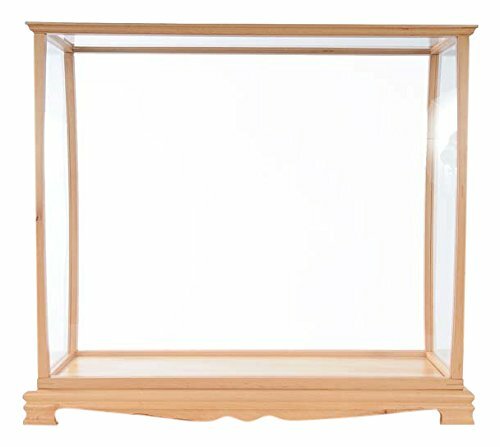 This beautiful display case was made out of hard wood and left unpainted to show case the beautiful natural wood color. It has distinctive design that add elegance and beauty when displayed in your home or office. It is used to display all tall ship 30 inches Expert levels such as HMS Victory 30 L and USS Constitution 30L. This case is very effective when it comes to preventing dust particles as well as keeping your valuable tall ship looking new and protected at all time. It is a must have for P033 ship enthusiasts or passionate collectors. This display case is shipped fully assembled. It is packaged securely with thick foam layers inside a wooden crate and ship safely via fedex ground. The maximum inside dimension is L: 32.5 x W: 12 x H: 29 inches. If you have any questions about this product by Old Modern Handicrafts, contact us by completing and submitting the form below. If you are looking for a specif part number, please include it with your message. Table Top Display Show Case. Bronze anodized aluminum frame and tempered glass construction. Key lock with three shelves. Measures 14" wide by 12" deep and 27" tall.